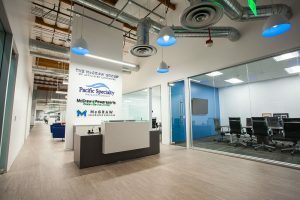 Last month marked a new chapter for Pacific Specialty Insurance Company as we officially moved into our brand new office in Anaheim, California. To commemorate the off-the-charts office upgrade, we sat down with contractor Cory Adler to get the scoop on the new space. Q: What made you choose this space when deciding on a place to put Pacific Specialty’s new office? 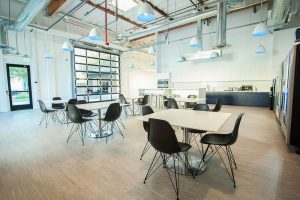 Adler: My personal goal was to find a practical space that employees would enjoy coming to every day, a space that they’d feel comfortable bringing clients to, and, ultimately, a space the company could be proud of. I wanted to bring Pacific Specialty into a modernized creative type space. PSIC is a privately-owned insurance company that has survived and thrived by remaining nimble and innovative through adapting to their client’s needs while staying true to their roots. I wanted their office to reflect this. Q: Were there any challenges in bringing this vision to fruition? Adler: It’s easy to dream big, but an entirely different story to make it a reality. There is that fun little word called “budget” that always makes things interesting. 1) Something that would accommodate more than 130 employees and stay within the same price range as their existing location. 2) A location that wouldn’t alter commute time for employees. 4) They needed it NOW. We had to get creative, and the only way to do so was to create our own space – but we had to do it at warp speed. As soon as I saw the blank concrete shell space at 5515 E. La Palma, I knew it could be a contender. The locational aspects were superb, within walking distance to a few large shopping centers with great restaurants and amenities, which is a rarity for Orange County, and it met all of their needs overall. We were able to hand PSIC the keys to their new home in October. Q: What are some of the aspects of this property that make it one-of-a-kind? 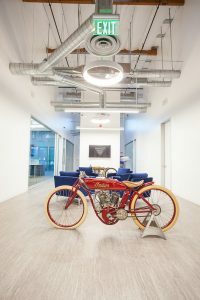 Adler: There are multiple aspects that make it unique: high, 22-foot exposed ceilings, three big roll-up garage-style doors, in-suite outdoor space, a detached entrance from the lobby, and 20-foot-high ceilings in executive offices. 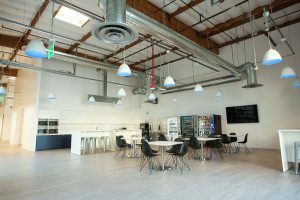 The industrial style section with 22-foot-high exposed ceilings is more like something you’d see at a Google campus in Venice and is pretty unique and innovative for Orange County. 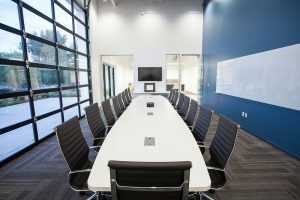 Tech companies notoriously invest in their employees by flocking to more modern, creative office-style spaces in an effort to create comfortable places to collaborate. As long as we stayed within budget, there was no reason this wouldn’t work in insurance as well. Q: This has been a quite the project in the making. Now that the office space is complete, what is your favorite unique feature? Adler: It’s a tie between the 22-foot exposed ceilings with skylights and the massive break room with roll-up doors that open to the in-suite outdoor space. I think it’s awesome to be able to take advantage of the Southern California weather while in the workplace. Q: What was the most fun part? Adler: The most rewarding part was seeing the finished product and watching the employees utilize the entire space. We were able to move 130 employees into the new space over a 2-day weekend with virtually no interruptions to service. On Monday, it was business as usual. Q: What was the initial reaction to the seeing the space? Adler: I think most couldn’t believe their eyes. You can really tell how much they’re enjoying it by how much they’re already utilizing the space. 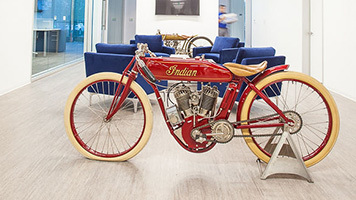 In the first two days, they had all the garage doors open and they even held a taco party happy hour in their in-suite outdoor space to celebrate the new digs. There are 5 large conference rooms and each one has already seen steady use.